Washington, D.C. – Prominent faith leaders from across the country joined forces today in urging Texas legislators to oppose a series of anti-LGBTQ measures advancing rapidly through the state legislature, specifically calling out controversial anti-trans bathroom bills, HB 2899 and SB 6, and several religious refusal bills that provide businesses and government entities a license to discriminate against LGBTQ Texans. Nearly two dozen anti-LGBTQ bills are under consideration in Texas. 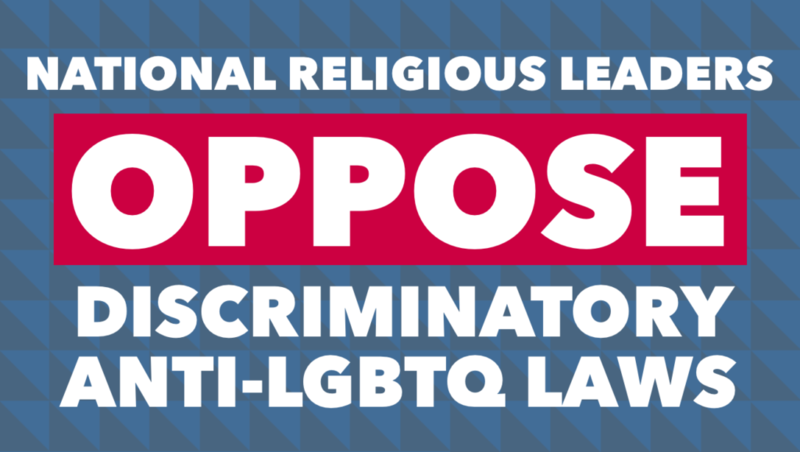 The call for opposition was made via a letter signed by more than 100 national religious leaders from across the country, and hand-delivered to legislative offices today with another letter signed by more than 200 Texas-based faith leaders. Texas clergy also gathered outside of the House chamber to pray and to take their message opposing discrimination directly to legislators. In addition to the letter from national religious leaders, which was organized by the Religious Institute, more than 200 faith leaders in Texas also signed a letter to legislators and gathered at the Capitol today to pray and demonstrate their strong opposition to the proposed measures. Texas Believes (www.TexasBelieves.org), a coalition of interfaith clergy who support equality for LGBTQ people, organized the event, which included delivering both letters in person to legislative offices. You can access the full text of the national letter as well as the list of more than 100 clergy who signed the letter here. The Texas letter can be accessed here.